Well- I was in the Vignola Market (see November 15th, 2007 entry) buying some white truffle oil Friday and it didn’t look any different, but when I got home I looked at the receipt and noticed it said Juliet’s Market and Cafe. A small blurb in the Frederick News Post a day later confirmed this. It appears the Italian market has changed hands recently, and is the Vignola Market no more. As of this time there are no noticeable changes and the signage is still the same. I will try to get some more info next time I stop by and let you know. You know how I feel about this, and it is the only location in Frederick for getting some hard to find Italian item so I hope it doesn’t change much. We’ll see. The new name doesn’t exactly fill me with hope. The other day I went to the Vignola Market. It was not my first trip there, and it certainly won’t be my last. If you’ve never been there it’s worth a trip. It’s located in downtown Frederick at 9 East Church Street. Now Italian food is in my DNA and I am an unabashed Italiophile and I want to love this place with all my heart, but if you’re expecting a full New York Style Italian Deli you’ll probably be disappointed. I’m sure the market isn’t there yet in Frederick for the deli of my dreams. However, it has a pretty good selection of items: a bunch that I have never seen elsewhere locally. Most of what it does have is excellent. Call it Italian Deli light (or leggero) if you will. For starters they make their own fresh Mozzarella, both plain and smoked. Beats the heck out of anything else I’ve found locally. For this reason alone it’s worth the trip. It also has a great selection of fresh pasta (very good) and their own pasta sauces and prepared pasta dishes (which I have not tried yet) as well as some harder to find Italian items such as anchovy paste, Italian dried pasta, 00 flour, instant polenta, and amaretti di saronna among others. They also have a selection of fresh Italian cheeses including mascarpone. The big disappointment: I ordered a tub of the fresh ricotta for some ricotta dumplings I was going to make. I figured from a store that makes their own mozzarella the ricotta ought to be good. I was dismayed to see the clerk then go and squeeze it out of a big Polly-o plastic bag. They charged far more than the tubs you can buy in the supermarket and it was just the same. 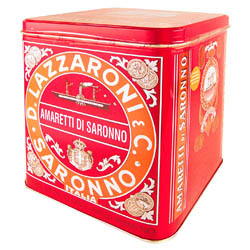 They also have an excellent selection of panettone this time of year in several different varieties. As I said worth the trip!